Italians take their coffee quite seriously. Some years ago we were visiting a friend in Italy and when we stopped in a coffee shop for a late morning cuppa, I made the mistake of asking for a cappuccino. He flat-out refused to order it, because it was “the wrong time of day” to be ordering such a thing. Now I’m completely on-board with the idea of certain drinks at certain times. I have been known to consult the clock when asked if I want tea or coffee – for reference: tea first thing, coffee until lunchtime, back to tea in the afternoon and finally coffee for the evening – but that is taking things a little too far in my book. The advantage of this attitude is that they’re also serious about the quality of their coffee. 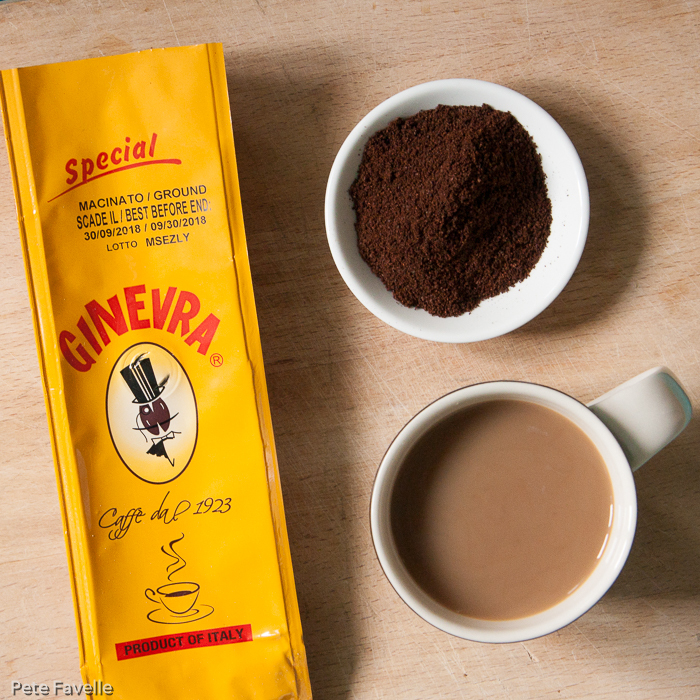 Ginevra have been roasting coffee in Sicily for nearly a century (since 1923) and in the last decade their coffee has been imported into the UK and is now easily obtainable online. The grounds are medium dark with a wonderfully rich and fruity aroma – sour black cherries and a little dark chocolate. Brewed, some dark old wood notes start to appear which marry nicely with the acidity of the cherries. In the mouth it’s rich and full bodied. A nice fruity acidity blends perfectly with a gentle brown sugar sweetness producing a flavour that is strong without becoming bitter or overpowering. This really is my kind of coffee; strong and richly flavoured with some nice acidity and no real bitterness. The result is a rich and wonderfully satisfying drink; 4.5 stars!